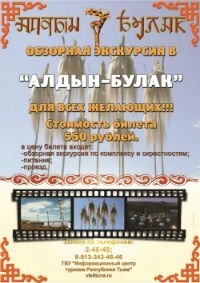 A film crew headed by Andrei Borisov, famous Yakut theatre director and culture minister in the Yakut government, has finished its work in Tuva. For over a month it filmed battle scenes for the film 'On Chingis-Khaan's Will' in which Tuvan actor Eduard Ondar plays the main role. He was chosen out of a dozen of other actors to interpret the image of the legendary Mongol warrior. Sun Radio Omniversity and WKCR 89.9 FM NYC present Sun Radio Omniversity, a Sun Ra arrival day celebration. Tune in for a 32-hour radio marathon, from midnight on Monday 22, 2006 to 8:20 AM on Tuesday, May 23, at 89.9 FM NYC and www.wkcr.org streaming live across the galaxies. This information concerning the Tuva's favourite American musicians (after Sun Ra Archestra took part in Ustuu-Huree-2004) was reported to Tuva-Online by producer Cornelia Muller. Tuvan Music and Drama theatre for the first time in its history performed in Moscow. It gave "King Lear' in the Russian Academic Youth Theatre. The play staged in Tuvan by Tuvan director Alexei Oorzhak is among nominees for the most prestigeous Russian theatre prize - Golden Mask together with theatre companies from Moscow and Saint-Petersbourg. Nomination has come just on time - in the jubileum year of the Tuvan theatre founded in March, 1936. Russian scholars from the State Hermitage Museum have concluded that a discovery of Scythian gold in a Siberian grave last summer is the earliest of its kind ever found and that it predates Greek influence. The find is leading to a change in how scholars view the supposed barbaric, nomadic tribes that once roamed the Eurasian steppes.